Holidaymakers and commuters faced long rail delays after a house in south London collapsed. Services between Bromley South and Shortlands were suspended and Eurostar trains to Brussels and Paris were unable to go in to or out of Waterloo. 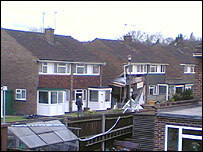 The rail disruption was prompted by the collapse of the semi-detached house in Ridley Road, Bromley, near the track. Some 14 homes had to be evacuated. No-one was injured but a 40-metre exclusion zone was set up. Eurostar passengers were being directed on to trains from Waterloo East station to Ashford International Station in Kent, where they could join the Channel Tunnel service. But following huge queues, Eurostar later advised passengers against travelling to Ashford and said tickets could be exchanged for another date or refunded. A company spokesman said: "This is a busy time for us with lots of children visiting EuroDisney." BBC reporter Leigh Mytton was among hundreds of holidaymakers redirected to Ashford. She told BBC News website: "The bottleneck seems to be at Ashford - no one's moving, there's no communication, just a lot of people running around in fluorescent jackets. Everyone is beginning to lose their temper. "The other problem is there have been no security checks so far and all the baggage needs to be scanned." A normal Eurostar service was expected to resume by Wednesday and Southeastern Railway services were back to normal on Tuesday evening. Fire crews were called at 0430 BST on Tuesday when a family found their front door had become jammed. Within hours, two large cracks appeared in their house and the road, eventually causing the side of the property to cave in. A police spokeswoman said the family were treated for shock. Gas engineers were dealing with escaped gas while surveyors investigated the cause. Early signs suggest the property may have collapsed as a result of subsidence. A spokeswoman for Bromley Council said residents from all the evacuated homes were staying with friends or family.